Lucinda Williams gives us quite a pleasant album, good lyrics, nice music, but nothing too spectacular really. She sounds a bit like a countrier Sheryl Crowe, wich isn't amazing but isn't bad. At times however, when she gets poppier she sounds a bit too much like Crowe. This might have to do with a production that is really too much for the style of music, this should be as plasticy as it ends up feeling. It is because of this that the folksier the track the better it is in this album, and so there are some pretty great moments in songs like Jackson or Joy. Still this album has such renown in the music business for not much reason. 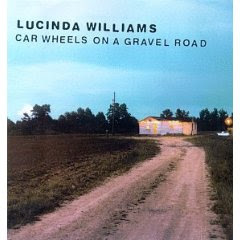 Car Wheels on a Gravel Road won a Grammy for Best Contemporary Folk Album, and was Willams' first album to go gold. According to Billboard in February 2008, the album has sold 811,000 copies in the U.S. It was voted as the best album of the year in The Village Voice Pazz & Jop critics poll. In 2003, the album was ranked number 304 on Rolling Stone magazine's list of the 500 greatest albums of all time. I can't believe you've got fewer than 150 album reviews to go.